There's another way that isn't talked about nearly as much as the others, but it can be just as supportive—if not more so in some cases. Visit their website or blog regularly. "But this is a common way," you say. True, but that's just the first part. There's something else you can do in conjuction with this which will help all author's websites you normally visit, and you only have to do it one time. First, it gives people in general a clear picture of how popular the author's website is. I've been to some seemingly popular blogs only to see an Alexa ranking of several million. And yet there would be tons of comments with each post, indicating a popular blog. My guess is that most of the regular visitors didn't have the Alexa toolbar installed. Though it's not the only way to track website traffic, it's one of the main sources that people can use without going to the website owner. Google analytics and Statcounter (which we use on this site) are great, but the website owner has to share their traffic stats with you. Not so with Alexa. Yes, a lower Alexa ranking may encourage the occasional browser to stick around longer, but there's an even better reason to help out an author in this way. It will open up opportunities for the author or blog owner. Two ways that I can think of off the top of my head. If the site is popular enough, the author or blog owner can be paid to offer advertising. That's the main gist of The Masquerade Crew. We get enough visitors that authors are willing to pay me to blog on their behalf, purchase ad space, and so on. 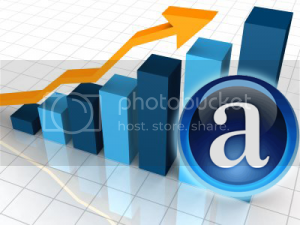 If the site participates in blog tours, a lower Alexa ranking will open up the flood gates. Some blog tour outfits require a certain Alexa ranking (usually below a million). So, by helping to lower their Alexa ranking, you'd be opening up cross promotion opportunities. And an author who loves to promote others will be a popular author. So, install the Alexa toolbar. Just go to Alexa.com and click on Toolbar. It's available for most (if not all) browsers. Authors everywhere will silently thank you.